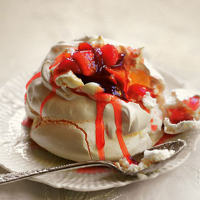 These delicious individual meringues are perfect for entertaining, at Christmas or throughout the winter. Start with the meringues. Preheat the oven to 130°C, gas mark 1/2. Line a baking tray with non-stick baking parchment. In a very clean, dry bowl, whisk the egg whites until they reach firm peaks. Gradually mix in 300g of the sugar and a pinch of salt, until the mixture is glossy and thick. Spoon the mixture into 8 rounds on the prepared tray. Bake for 1 hour 15 minutes, until firm but not coloured. Cool on a wire rack. Meanwhile put the fruit in a small saucepan with about 4 tablespoons of cold water and the honey or agave. Warm over a low heat for about 8 minutes or until softened. Strain through a sieve, and set the fruit aside. Pour the juice back into the pan with the remaining sugar. Cook over a low heat for about 10 minutes or until thickened and syrupy. Allow to cool, then mix in the fruit and chill for at least one hour, or for up to 24 hours. Whisk the cream with about 3 tablespoons of the fruit syrup until it starts to thicken, then whisk in the yogurt. Serve the meringues topped with the cream and fruit, then drizzled with syrup and scattered with almonds. Make the meringues up to 2 weeks in advance and keep in an airtight container. You can also prepare the fruit and whip the cream up to 24 hours in advance, then assemble when needed.